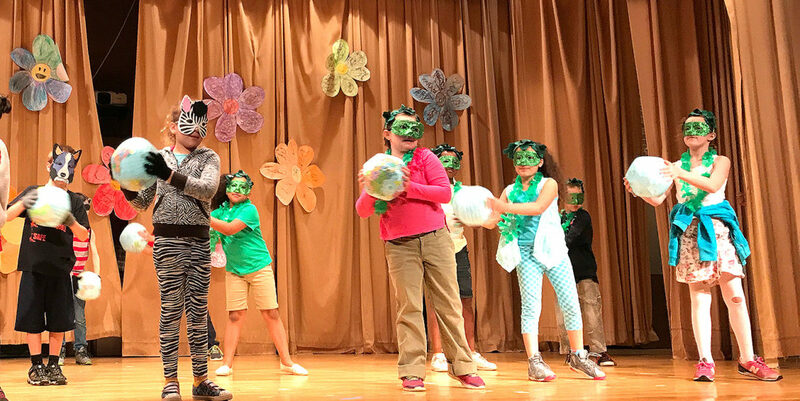 Ring Elementary School students are pictured performing a song about life cycles recently. Kim Austin, Beth Johnson, Kaylin Conti, Krista Boardman, Patrick Langworthy and Melissa Yost, Ring third-grade teachers, discovered the musical that was all about life cycles on-line from Bad Wolf Press, which provides all kinds of musicals for science, language arts and social studies. The teachers purchased the songs and lyrics and adapted the script to fit their students’ needs. Each class took one or two songs to create dances and costumes to fit the lyrics. The musical fit in well with the student’s curriculum. In English language arts, the students complete a unit on frogs, learning all about their life cycle as they read the book, “Bullfrog at Magnolia Circle.” Students also conducted a research unit on freaky frogs. Later in the year, students do a science unit where they raise painted lady butterflies and learn more about plant life cycles with materials provided by Wal-Mart. The students also learn more about habitats, along with animals’ adaptations for survival, and key vocabulary words. All of the songs in the musical helped students review the concepts learned during class and act out the vocabulary.